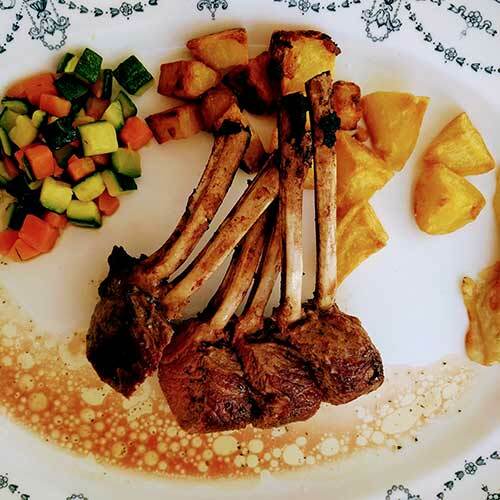 Carré di agnello designates a rack of lamb, which may be appended with “al forno” or “arrosto” meaning baked or roasted. Carré di agnello may come “in crosta de pane alle erbe” meaning a crust of breadcrumbs and herbs. The rack of lamb can also come with a crust of pistacchio or just herbs. The lamb in the picture was called Carré di agnello al forno alle erbette aromatiche, on the menu, meaning cooked in the oven with aromatic herbs. This secondo piatto comes with the contorno on the plate, included in the price. You might find the notice, “Tutti i secondi piatte sone accompagnati con il contorno” meaning all the second plates are accompanied by an appropriate side dish. Notice also that the lamb in Italy is much younger than most lamb you buy in supermarkets in the US.